“Soho” is the new name for the neighbourhood that has been around since London’s earliest beginning in 1840 and used to be known as “St. David’s Ward.” The new name stands for “South of Horton” and encompasses the areas bound by Adelaide Street, the CN Rail Yard on the north and to the south and west by the Thames River. For real estate purposes, the northern boundary encompasses the part of Downtown between the rail yard and Dundas Street. As a result, a number of notable city landmarks are included in this real estate zone. It is an area that has affordable housing and easy access to all the amenities of downtown. Nine bus routes run through the area. Is named after the famous flower, fruit and vegetable market located in London, England situated over the convent garden owned by the Abbey of Westminster. Over the years, convent was changed to “covent.” The first home of the market was on the courthouse grounds across from the Peter’s McGregor’s tavern. In 1835 permission was given by the Lt. Governor for the sheriff to maintain a market, collect taxes and keep the market in good repair. In 1846, land was donated on the rear of several lots at the corner of King and Talbot Streets, land considered of little value at the time. The same year the market was recognized as London’s official market. In 1853 W.B. Leathers and Samuel Peters were appointed architects of the new market and a one and a half story yellow brick structure was built. The market became the commercial centre of the city in the years that followed. In 1903, under the threat of being condemned, the building received a much needed face-lift and was painted red. By 1926, the annual turnover of the market was conservatively estimated at $1,250,000, about $8,000 a day. During this time, the growth of the automobile demanded changes and directives for a new building were issued that would include parking. Parking remained a problem until 1953 when Londoncitizens voted in favour of leasing the market square to a private company to build a new market and a parking building. $1.1 million was raised by a non-profit company set up for the new venture. Completed in 1956, it was constructed from east to west towards the still standing 1853 building. When the new structure was half built, vendors were moved into the new building and the old structure was demolished. In 1999, after 10 years of planning, a new Covent Garden Market opened on the same site with a design meant to capture the style of the original structure. It had half of the parking of the previous building, reflecting changes in shopping habits of Londoners. 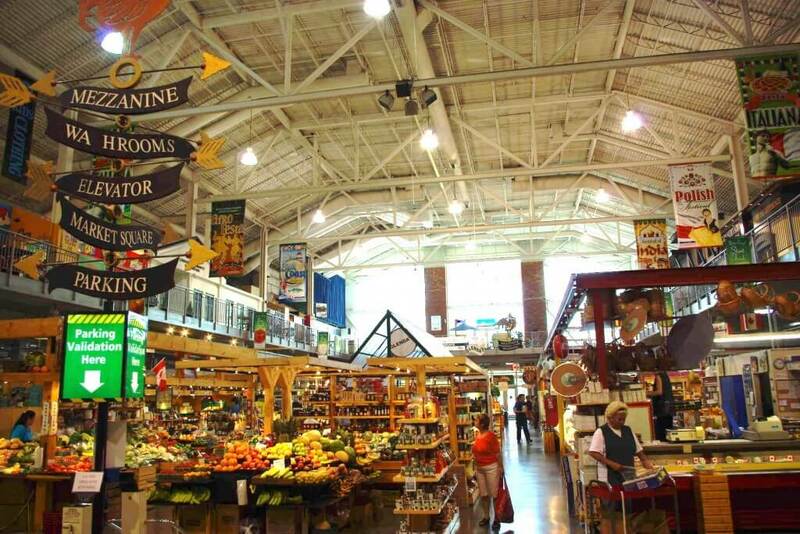 The current Covent Garden Market is home to more than 50 different vendors, varying from farm fresh produce to fully licensed restaurants and everything in between. The market is part of the cultural heart of London. The YMCA of Western Ontario, Centre Branch is an 85,000 square foot facility located in the heart of downtown London at the corner of King and Waterloo. The facilities offer a full gymnasium, 2Pools (one 25 metre, one with adjustable floor), aerobics studios with sprung hard wood floor, full fitness centre with Life Fitness and Technogym Equipment, free weight work out area, cardio theatre with cross trainers, treadmills, exercise bicycles, stair masters, rowing machines, an indoor running track, a racquetball court, 2 squash courts with free parking for members. On August 11th, 1960 Wellington Square officially opened as the first downtown climate controlled, enclosed shopping centre in North America. The 400,000 sq.ft. centre was a “shopping showpiece” anchored by a five storey Eatons, a Woolworths and rooftop parking. The centre was known as Wellington Square until 1980 when the property was re-named London Eaton Square. In 1987, Canadian mall giant Campeau Corporation launched the redevelopment of London Eaton Square and expanded it from 70 stores to 175. An additional 500,000 square feet were added with a racetrack design on the upper level, two pedestrian bridges and a 1,500-space underground parking garage. 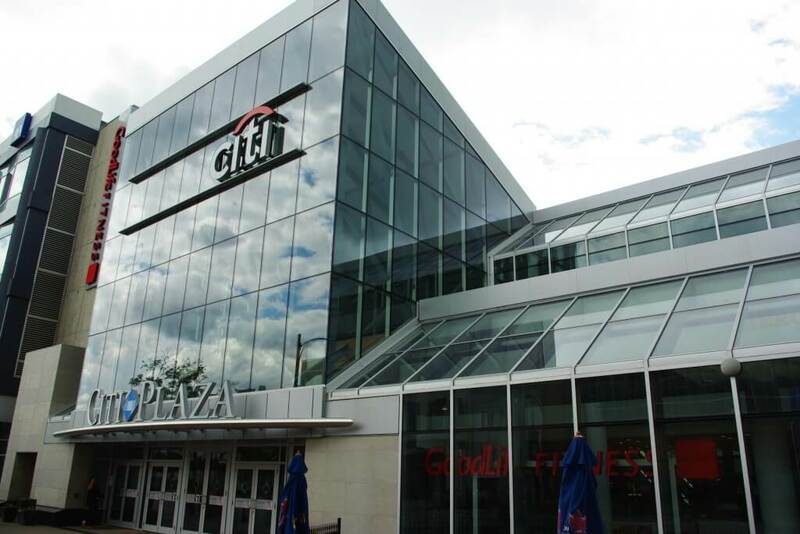 On August 16th, 1989 Galleria London officially opened as one of the largest downtown shopping centre in Southwestern Ontario anchored by Eaton’s and The Bay. Eaton’s filed for bankruptcy and closed its 100,000 square foot store in 1996. The Bay remained as the sole anchor in the Galleria London until March of 2001. The space was then sold to the London Public Library. On May 7th, 2009, Galleria London was officially re-named Citi Plaza following an extensive redevelopment project that has transformed the property into a mixed-use complex featuring retail, business and consumer services, education providers and offices. A new signature atrium entrance on Wellington Street sets the stage for the centre’s dramatic interior transformation that includes an exciting new food area, washrooms and a revitalized retail concourse. From desk time to down time, Citi Plaza has it all: a space to work, grab a bite, shop, workout your body or your mind. Visit us today. The Convention Centre is a 70,000 sq. ft. facility in the heart of London’s downtown, including the 33,000 sq. ft. column free Grand Ballroom. With rich finishes throughout, the atmosphere is as beautiful as it is functional. 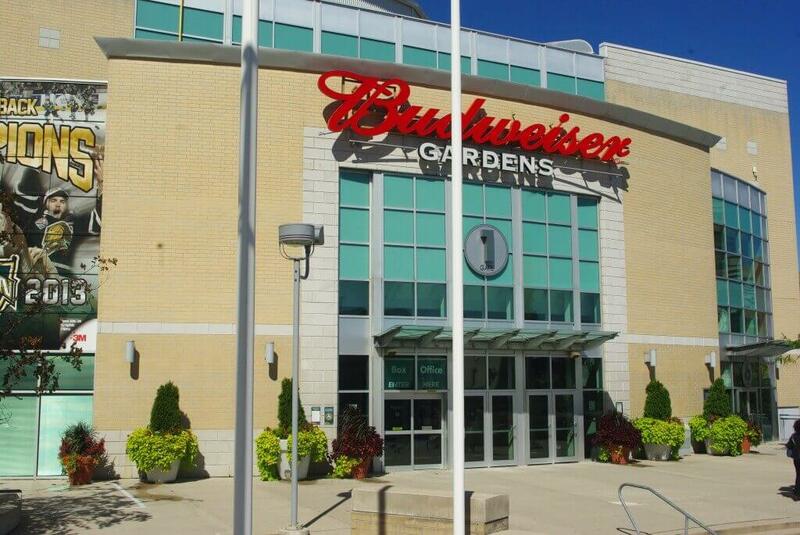 Close to hotels, shopping and the Via Rail station the Convention Centre is a convenient as it is beautiful. Museum London is proud to house one of Canada’s great art collections, and one of the most significant historical artifact collections in Ontario. Their art collection has more than 5,000 regional and Canadian works and their 25,000 artifacts reflect the history of the City of London as an important urban centre in Southwestern Ontario. There are a number of parks, including Hill Street Park, Maitland Street Park, Meredith Park and the Peace Gardens. Elementary schools include Aberdeen Public School, St. John’s French Immersion Catholic Elementary School. H.B. Beal Secondary School is the only secondary school in SoHo.